Board Games are making a comeback, but in shorter versions, because kids just don't have enough time. 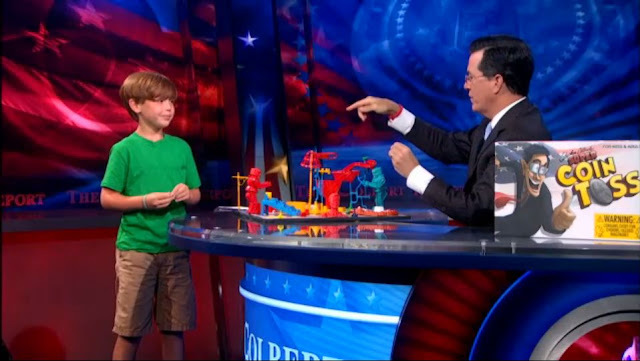 So Stephen Colbert designs a board game called Super Coin Toss. "It all takes place in the enchanted realm of Quarteria. Each player has farmers, soldiers, merchants, and bandits, and the object is to cultivate enough grain that the merchants can sell to pay the soldiers to protect you from your opponent's bandits. And of course, there are two giant robots who box. To start we put our tokens one space from the finish line. Whoever goes first wins the game. To determine that we flip the Medallion of Fate, which is designed to look like a US Quarter, sold separately, for $5." Through your pen I found the problem up interesting! I believe there are many other people who are interested in them just like me! Thanks your shared!... I hope you will continue to have similar posts to share with everyone! I believe a lot of people will be surprised to read this article! I love watching Stephen Colbert's shows) He is hilarious. It really worth every single minute of screen time. When I'm in bad mood, or when I don't have any ideas on what to write in the review of I write essays, I always turn on his show. He helps me greatly all the time. I can find the power to do anything after this show.